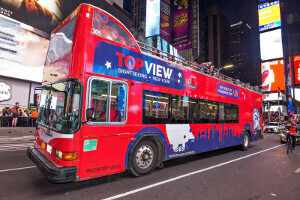 With a large fleet of double decker buses equipped with a cutting-edge GPS triggered audio guiding system, TopView® tells the story of NYC in 11 languages. 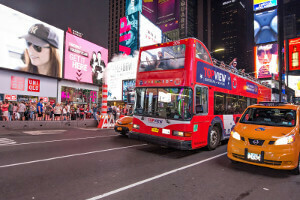 Totaling 40+ bus stops, TopView®’s double decker buses stop at major NYC attractions, making it convenient for customers to explore the city at their own pace. TopView®’s high standards of service are reflected in professional drivers, friendly customer service, and top-notch technology: clean-air technology on buses and real-time live map to track hop-on hop-off buses. Buy a ticket from TopView®, and we’ll be your ticket to the city. Your NYC adventure awaits! Our double-decker buses have become an easily recognizable sight on the streets of New York City. Our ambitious routes take our buses to neighborhoods all across town, from the Bronx to Brooklyn, while the size of our fleet ensures that there's always a bus available for our customers. 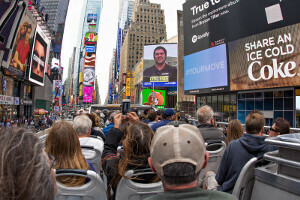 Low wait times, diverse routes, professional drivers, and cutting edge GPS and touring technology guarantee that TopView® is the #1 choice for touring the Big Apple! 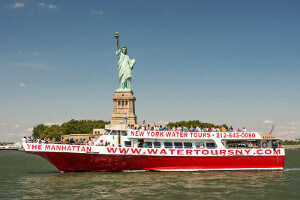 Every year we give over half a million customers the best tour available in NYC! With the option to hop on and hop off at any of our many stops, feel free to leave the bus and experience the real streets and landmarks of the city. At TopView®, we're in love with New York City and passionate about providing you the best possible introduction to the Greatest City on Earth! New York City is a diverse and complex place, so we crafted a set of tours designed to match it. Our extensive routes deliver a taste of everything New York City has to offer. In addition to Uptown and Downtown Manhattan, visit different boroughs like the Bronx and Brooklyn, or distinct cultural enclaves like Chinatown and Little Italy. Our destinations include the most essential sites for entertainment, shopping, culture, and history. 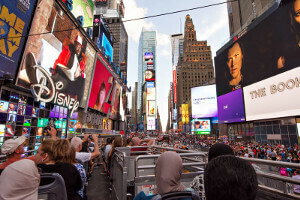 Our unique Night Tour adds an exciting twist on the City That Never Sleeps. 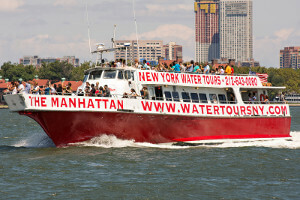 Go sightseeing or plan an adventure, because in New York City there's always something waiting to be experienced! You can reach us during our normal business hours which are Monday – Sunday 8am – 7pm, and we also offer limited support Monday – Sunday from 7pm – 9pm. 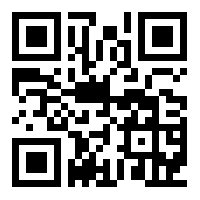 For further information about TopView Sightseeing® please contact us.